From challenging coastal terrains to dense pine forests and mature oaks, Charleston golf course communities are as diverse and storied as the Holy City itself. Dating back to 1786, the Country Club of Charleston is the city’s oldest and most revered golf club. Situated on the property of McLeod Plantation off Folly Road in James Island, the Country Club of Charleston consists of 900 lush acres along the scenic Ashley River. Reminiscent of Scottish golf greens, the course was originally designed in 1929 by Seth Raynor. After hurricane Hugo in 1989, the southern style clubhouse was fabulously rebuilt and now features an expansive dining room, fitness facility, swimming pool, and tennis courts. Golf architect Brian Silva restored the course to its prime condition in 2006. Today, the Country Club of Charleston hosts several tournaments throughout the year, including the annual Azalea Invitational, which is held the week before the Master’s golf tournament. Homes for sell in Country Club II are a rare commodity with prices ranging upward of $2.5 million. With spectacular views of Fort Sumter, the Charleston Harbor, and downtown Charleston, Patriot’s Point in Mt. Pleasant is another popular golf course. Though not a golf home community, nearby neighborhoods include the Old Village and Cooper Estates. Other Mt. 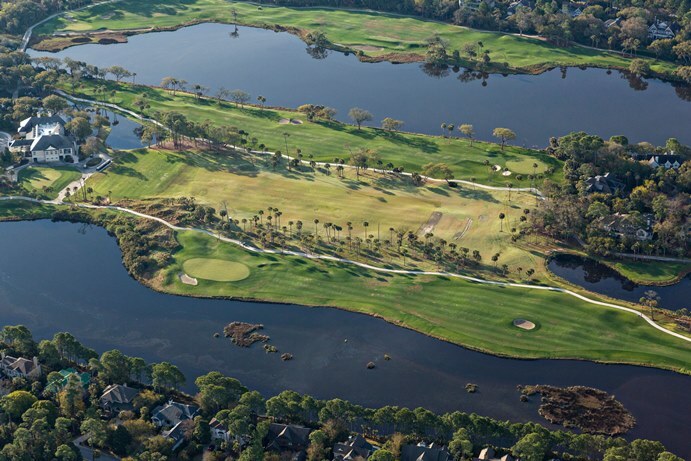 Pleasant golf communities include Dunes West, Charleston National, Snee Farm, and Rivertowne Golf Club. 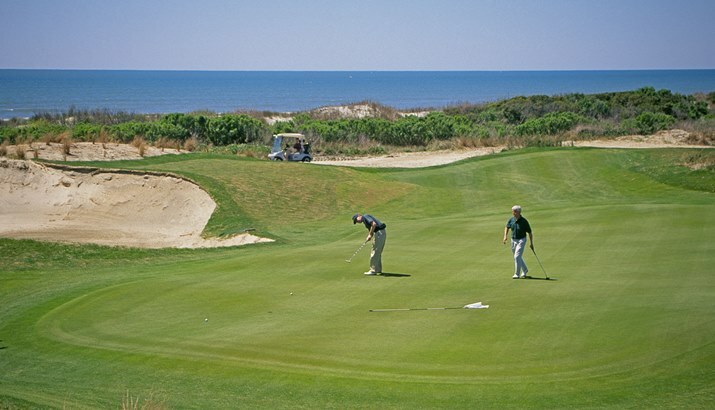 For a private club option, Wild Dunes Resort and Golf Club is located in nearby Isle of Palms. Slightly north of Mt. 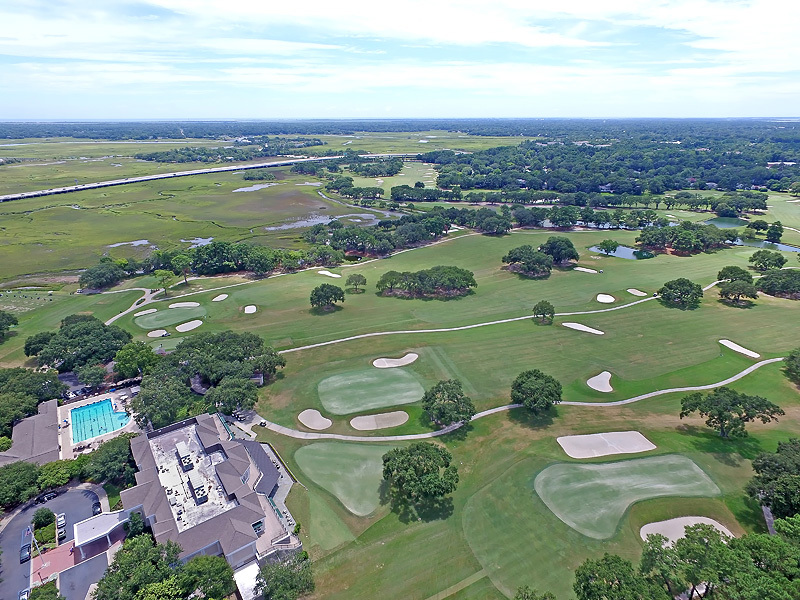 Pleasant in Awendaw is Bulls Bay Golf Club, an ultra private residential community whose clubhouse is atop the highest elevation in all of Charleston. Led by the vision of club owner and Charleston native Joe Rice, the course was designed by the late Mike Strantz to emulate the gorgeous golf greens in Ireland and Scotland. With rolling terrain and breath-taking views of the Atlantic Ocean, Intracoastal Waterway, and tidal marshes, the challenging course forces acute awareness of one’s surroundings and strategical preparation to combat the windy coastal conditions. Inside the gates of Bulls Bay, real estate options include custom waterfront estates, golf cottages, and single family residences. All the homes within this private and tranquil community are situated on large lots. Golf members are privy to The Ranch, an exclusive teaching facility led by well-known golf professionals. Not surprisingly, Golfweek ranked Bulls Bay Golf Club one of the top 100 residential courses in America. Hailed the “best value golf course in Charleston” by Golf Digest, Shadowmoss Golf Club is located just west of the Ashley River off historic Highway 61. Designed by Russell Breeden, the public course features five sets of tees, making it playable for all levels. Homes in Shadowmoss Plantation feature views of the golf course or nature preserves. Comprised of nine distinct neighborhoods, the community presents an abundance of amenities including a clubhouse, swimming pool, toddler splash pad, fitness center, and a restaurant. Not too far from West Ashley is perhaps the best known and arguably the most prestigious golf course community in Charleston: Kiawah Island Golf Resort. Ranked the number one golf resort in South Carolina, Kiawah Island Golf Resort is comprised of five championship courses, all certified by Audubon International as cooperative sanctuaries because of their preservation and enhancement of wildlife habitat. Home to the 1991 Ryder Cup, 2012 PGA Championship, and many other high profile golf tournaments, Kiawah’s Ocean Course is often referred to as the Pebble Beach of the south. Designed by Pete Dye, the challenging, windy course has received numerous accolades, including #3 “Public Golf Course in the U.S.” by Golf Digest and the #4 “Top 100 Courses You Can Play” by GOLF magazine. With unobtrusive views of the Atlantic Ocean and tidal marsh, the Ocean Course is certainly a bucket list venue for golf enthusiasts. Designed by golf architect Tom Fazio as a members’ only course, Osprey Point is another fantastic links course that takes full advantage of Kiawah’s natural foliage. Recently renovated Oak Point, a Clyde Johnson design, is situated along the Kiawah River and Haulover Creek and is described as shot maker's course due to the mental aspect of greens play. 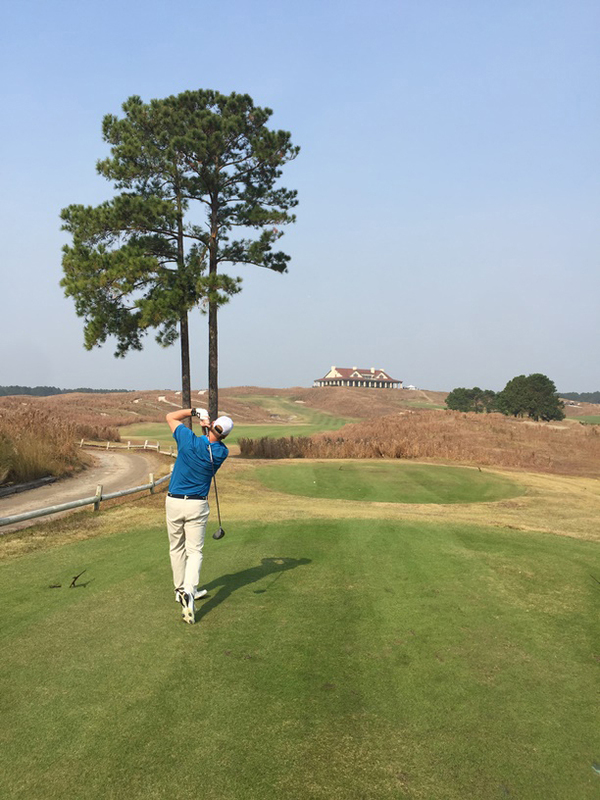 The South Carolina Golf Course Owners Association recently rated Cougar Point, designed by golfer and course architect Gary Player, as the Golf Course of the Year. Legendary golfer and esteemed designer Jack Nicklaus is currently fathering modifications to Turtle Point, a course that, like so many of Nicklaus-designed greens, requires mind over muscle. Apart from the courses at the golf resort, the private, members-only Kiawah Island Club has two exclusive courses: Casseque and River Course. Both are residential courses and showcase Kiawah’s properties which include golfview villas, townhomes, tennis condos, riverfront homes, and custom, oceanfront estates. Kiawah’s neighbor, Seabrook Island, also features a private golf course that is well known for its tropical foliage, mature oaks, and wildlife habitat. Daniel Island Golf and Country Club is another private, members-only facility that is ideally situated along the Wando River. The club boasts two championship courses, Beresford Creek designed by Tom Fazio and Ralston Creek designed by Rees Jones. Both greens feature dramatic views of the brackish tidal marshes and Daniel Island Park real estate. The southern style clubhouse is a popular venue for weddings and special events, and the club offers an abundance of amenities including a guarded, recreational swimming pool with a slide, lap pool, clay tennis courts, playground, dining options, cabana bar, and fitness facility. As an added bonus, members of Daniel Island Club are able to improve their golf game with priority instruction from the on-site Cerrudo Learning Center. Other popular, public courses in the Charleston area include Stono Ferry in Hollywood; Coosaw Creek in North Charleston; Crowfield in Goose Creek; and Legend Oaks, Westcott and Pine Forest in Summerville. For beginning golfers, the First Tee of Greater Charleston is an exceptional organization that offers affordable golf lessons and promotes character building skills to children ages 5-18. Presently, the First Tee offers instructional classes at Charleston Municipal, Berkeley Country Club, Westcott, Pine Forest, Shadowmoss, and Patriot’s Point. Wherever you decide to tee up in the Lowcountry, the friendly course attendants and service personnel coupled with the jovial spirits of other players, will certainly lend to a memorable outing. With Charleston’s relatively mild seasons, golfers are able to play year round.